Introduction Our previous work has shown a clear clinical and statistical significant difference in Plantarflexor power between healthy controls and participants with Achilles tendinopathy (AT), p ≤ 0.004 for all test positions and speeds. This data showed that the Soleus is responsible for the majority of the observed power deficits. Aim -Determine how an eccentric regime alters Plantarflexor muscle power. Method 24 runners with AT completed an eccentric training regime for 12 weeks.1 Muscle power was measured at baseline and 12 weeks follow up using an Isokinetic dynamometer. Testing utilised a knee extended and knee flexed position and concentric and eccentric speeds of 90º/sec. The control group comprised 27 healthy runners without AT tested on a single occasion. Results Paired t tests show significant changes from baseline to post intervention for both test speeds and positions (p = 0.008 – p < 0.001). 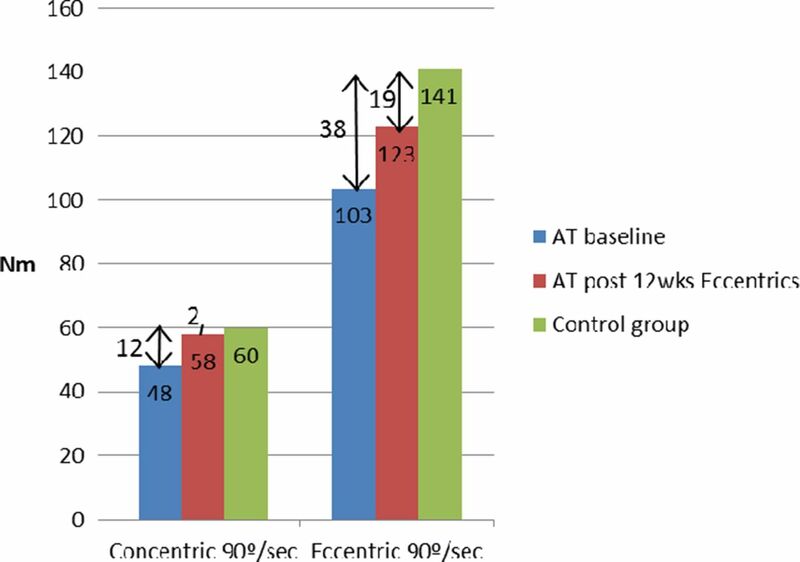 After the intervention there were still significant differences between healthy controls and the AT group for both test speeds in knee extension (p = 0.048 – p < 0.001) but only eccentric power differed in the flexed knee position (p = 0.26 for concentric and 0.026 for eccentric). Discussion This is the first study to compare Plantarflexor power pre and post intervention between participants with AT and healthy controls. The eccentric regime significantly improved Plantarflexor power for the tested parameters, however the regime did not fully resolve the deficits in muscle function. The concentric deficits vary markedly between test positions, since they are greatest in knee extension we may assume Gastrocnemius is responsible and not fully rehabilitated.2 The eccentric deficits are similar in both knee extension and flexion and it may be that Soleus was not fully rehabilitated with the intervention. These residual deficits in muscle power may explain why previous injury is a risk factor for further tendinopathy. Conclusion A 12 week eccentric protocol does not completely resolve muscle deficits associated with AT.